January 18th, 2019 marked a milestone for nursing students of the University of Belize (UB) as the University held its first-ever Capping and Striping Ceremony. The Capping and Striping Ceremony is a symbolic rite of passage for third year students, who are about to start their clinical practice. It is where nursing students become prominently positioned to carry the mantle of the nursing profession, denoting a clear symbol of the accomplishments and successful progression within the nursing educational program. President of the University of Belize, Professor Emeritus Dr. Clement Sankat, said in his address to the students, that the nursing profession is a gift, one counted as the most trusted profession. “The gift of nursing will give you access to someone’s most intimate world… This is a sacred place … and empathy is a must if you are to fulfil your obligations as a nurse. 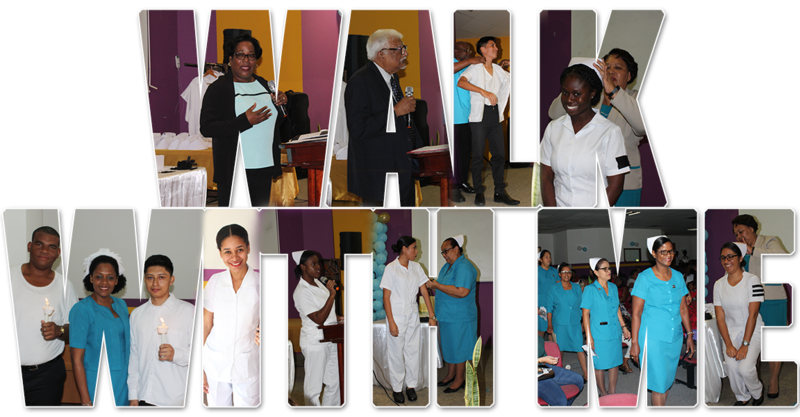 It is in this regard, the theme, “Walk with Me,” for today’s ceremony, couldn’t be more appropriate for your patients will ask you to walk with them; and so will your colleagues in the profession. You will have to be able to listen to your patient’s fears and concerns; you will have to be able to communicate with them and for them when they cannot…"
He also encouraged the students to take on ‘this walk” with commitment and a sense of duty. “As you endeavor to walk with those in your care, there must be moral equilibrium and a recognition of the immense responsibility and accountability. There must be a keen sense of duty and commitment not only to self, not only to the profession, but also to your patients and to your country,” he added. 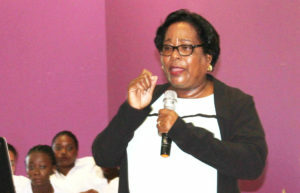 Dr. Marjorie Parks, former Deputy Director of Health Services and the first nurse in Belize to earn a Doctorate was the Ceremony’s Guest Speaker. She congratulated the nurses on their accomplishments, while speaking on the history and purpose of the nursing cap. She also explained that the caps for Registered Nurses have a black stripe in honor of Florence Nightingale, the founder of modern nursing. Dr. Parks, like President Sankat, wished the students every success on their new journey in the nursing field and challenged them to be positive change agents. Present to show their support for the nursing students were also Mrs. Ann Matute, Deputy Direct of Health Services, Mrs. Michelle Hoare, CEO of Karl Huesner Memorial Hospital, the Dean of the Faculty of Nursing, Mrs. Leolin Castillo, who gave brief remarks, Faculty and Staff of UB’s Faculty of Nursing, Allied Health and Social Work, Ms. Julianne Pasos, Dean of the Faculty of Science and Technology and Dr. Jean Perriott, Dean of Student Affairs as well as the parents, guardians and family members of the nursing students. The highlight of the ceremony was the capping and striping of the forty-seven (47) proud students. The six (6) males were “coated” and striped by UB’s two male nursing lecturers. Mrs. Ann Matute, Deputy Director of Health Services, capped the 41 female students while the female faculty members took turns in striping them. Ms. Ashli Swift was the student with the highest cumulative grade point average and had the opportunity to deliver the honor student remarks. The University of Belize would like to take this opportunity, to once again, congratulate its talented nursing students on this accomplishment. We urge you to continue to educate yourselves, continue to be trained, to be successful in your profession and continue to shine and make UB proud.